“The most dangerous, poisonous and ferocious animals are only humans.” ― Amit Abraham. We all do have both positives and negative traits in our personality. While some of these negative traits are less bothersome, some are definitely to watch out for. In this article we have made a list of all the dangerous traits in the zodiac signs and an insight into their this behaviour. A general rule of thumb being, don’t mess with anything that can sting, poison, maul, or ram you. 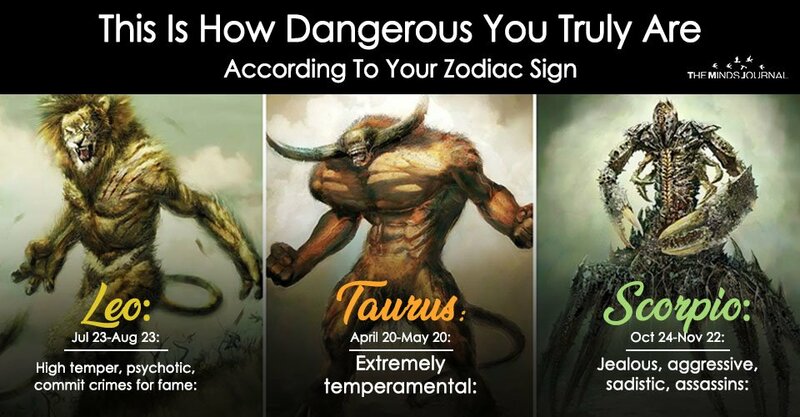 Here’s a list of the most dangerous zodiac signs, RANKED from Most to Least. According to FBI, this is the most dangerous of all the signs, committing crimes of passion, leaving distinguishing marks on their victim’s body. They get arrested the most for committing crimes repeatedly because of their lack of mental stability. The stubborn bull holds the 2nd place. When gone astray, they become fierce dictators of the world. Natural leaders they are, they can become hell-bent on dominating the world and nothing can come in their way. They don’t shed blood until and unless their lives are in danger but can be extremely harsh. They are known for being excellent thieves and belong to the list of notorious criminals who escaped from prison. The stubborn Aries hates to get dominated and if one tries to do so, they bounce back. Chances are they will seek illegal careers like work as hired gunmen to avoid the rat race and achieve success in life. The Capricorn is well-equipped to commit crimes from any range, be it a petty pick-pocketing or a serious act of murdering someone. Their disadvantage is that they are careless and can get easily caught. The perfectionist Virgo is a specialist in stealing. They know their job well and do it with such neatness that it’s difficult in finding a trace of their crime. Hacking, burglary are the crimes they commit. The one with the symbol of scales can commit crimes too but they don’t break the law easily. They are more interested in money and get involved in crimes related to monetary gains like bank robbery. Drugs is their another field of interest. They avoid doing it individually and are usually seen working within an organization to get things done. The dreamy fish is likely to lose their cool. Pisces tends to be hot-tempered and if not attended, can become serial-killers. They are also likely to abuse their own body using drugs.